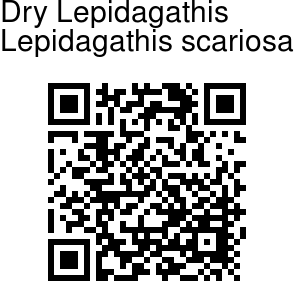 Dry Lepidagathis is a woody. velvet-hairy prostrate herb. Leaves are up to 3.5 x 2 cm, ovate, elliptic, tip pointed, base wedge-shaped, velvet-hairy; leaf-stalk 1-1.5 cm. 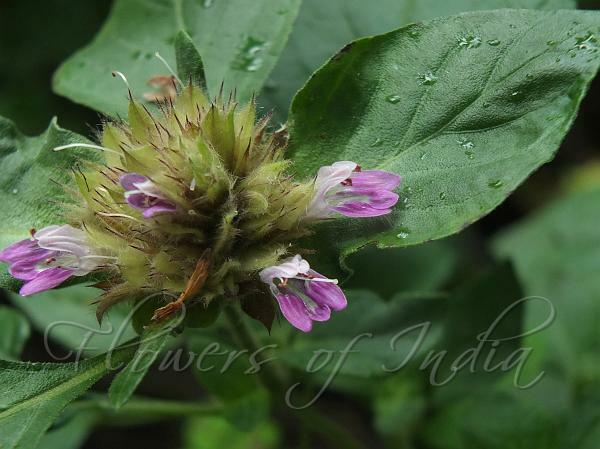 Flowers are borne in heads at branch-ends, 3 cm long, ovoid; bracts obovate, hairy; bracteoles 7 mm, hairy, mucronate. Sepals are 5, upper 1 x 3 cm, obovate, fringed with hairs, lower 8 x 2 mm, basally fused, spinescent, the lateral 2, 6 x 1 mm, lanceshaped, fringed with hairs. Flower tube is 1 cm hairy, petals 5 mm, white; filaments 5 mm, anthers 1.5 mm; ovary 2 mm, oblong. Dry Lepidagathis is found in Peninsular India and Arabia. Flowering: November-February. Identification credit: Siddarth Machado Photographed in Sathyamangalam Tiger Reserve, Tamil Nadu.